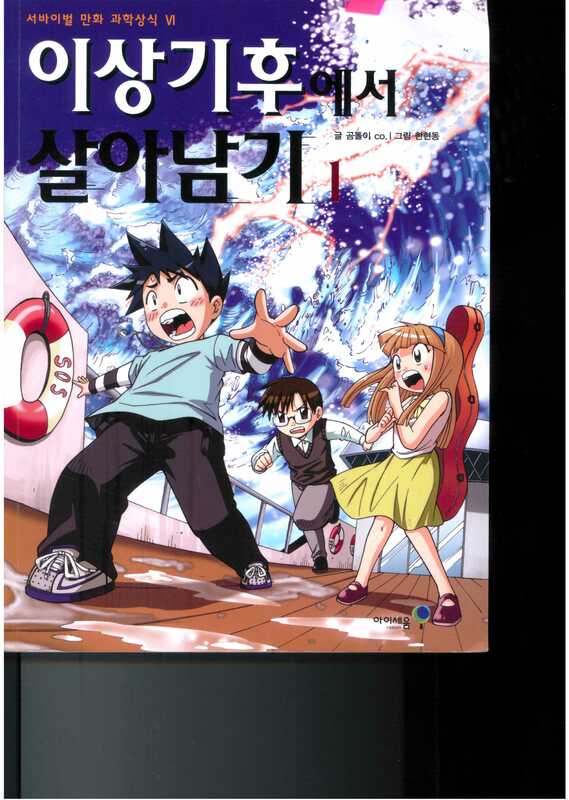 One of the most remarkable comics that I have seen of late comes from the “Survival ” (살아남기) series published by I-Seum. This comic, “Surviving Climate Change” explains in considerable detail, with reference to scientific data, the process of climate change. The “Survival” series includes several quite powerful comics that blend relevant facts with an entertaining narrative. “Surviving Climate Change” is notable in that it draws the attention of children to the concrete challenges we face. Such writing for children is absolutely critical in our age as they will be the ones who will struggle with the consequences of our decisions. The comic is divided into three sections. A humorous, slightly slapstick, dialog between the protagonists, a crisis that the protagonists encounter that brings them face to face with the consequences of climate change and a more detailed description, including actual photographs and statistics, that supports the arguments made in the comic. This address is interesting in several respects but above all in its emphasis on the transformative nature of culture and the value of a convergence of fields. As I take office as the 18th-term President of the Republic of Korea, I stand before you today determined to open a new era of hope. It is a great mystery how so many of America’s best and brightest somehow think they have no responsibility to work for future generations. Perhaps the attitude is born of a consumer culture in which the highest value is consuming for oneself and ignoring the past and the future. Most Americans do not even realize they suffer from this affliction.